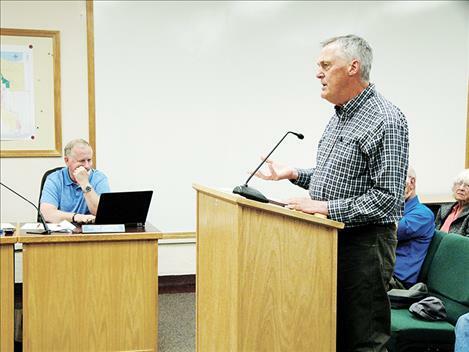 Gayle Siemers, chairman of the Polson Redevelopment Agency, addresses Polson City Commissioners during their last meeting June 18. Three Polson businesses will get significant upgrades, thanks to grants facilitated by the Polson Redevelopment Agency. The city commission approved funding for improvements to the exteriors of Pebble Creek Enterprises, LLC, Mission Valley Ice Arena Association, and Polson Theatres, Inc. The businesses received the grants from the PRA Funding Program. The program funds projects that will improve unsightly, blighted areas in the city, increase tax revenue, and stimulate the local economy. PRA Chairman Gayle Siemers said that before the grants are finalized, the department of revenue would assess the projects to ensure that they will increase tax revenue in the city. The funds awarded come from property taxes in Tax Incremental Finance districts, which have been identified as blighted areas. Pebble Creek Enterprises, LLC, is a construction company in Polson. The PRA will award the company $8,800 to pave a parking lot on the business property. Mission Valley Ice Arena Association is working to build an ice arena in the city. The project has not yet broken ground. The $160,000 PRA grant will fund a parking facility at the arena, to be located at the site that was formerly the rail yard. The parking lot will also be available for RV parking in the summer and to the public for use during special events. Siemers said that the PRA is “very excited” that some grant funds will go to renewing the rail yard area, which is one of the PRA’s priorities. Polson Theaters, Inc., which runs Showboat Cinema, will receive $160,000. The business will use the funds to acquire land and improve the façade on the main street building where the theater currently operates. Becky Dupuis, owner of Polson Theaters, Inc., said that the improvement project funded by the PRA would be part of the cinema’s larger expansion. Dupuis said that the theater will be enlarged and four new screens will be added. During public comment a community member pointed out errors and ambiguities in the proposed contracts. The commission agreed to have lawyers and city staff review and edit the documents before they are finalized.